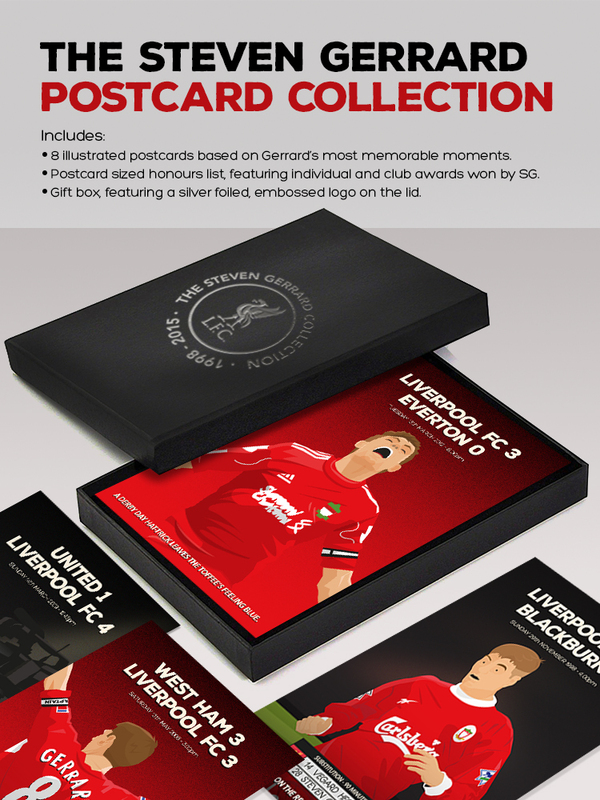 To celebrate one of Liverpool's greatest ever players, the Steven Gerrard postcard series is a collection of 8 beautifully illustrated postcards, highlighting just some of the many standout moments from Gerrard's illustrious playing career. This special collectors set comes complete with a stylish black gift box, imprinted with a silver foiled logo on the lid to keep your postcards in pristine condition. 2) Winning the treble in 2001, capped off by victory vs Alaves in the UEFA Cup final. 3) Scoring the last minute goal vs Olympiacos at Anfield that secured qualification to the next round of the Champions League in 2004. 4) Winning the Champions League in Istanbul after the famous comeback in 2005. 5) The Steven Gerrard FA Cup final in 2006. 6) The original kissing of the camera in 2009. 7) Scoring a hat-trick vs Everton in the Merseyside Derby in 2012. 8) Gerrard's final appearance at Anfield vs Crystal Palace. The set also includes a ninth postcard featuring all of Steven's honours. When arranged in a 3x3 formation in order, the reverse of the Steven Gerrard Collection forms an image of the Number 8, in tribute to our captains shirt number.